John Abraham and Sonakshi Sinha starrer Force 2 has had a clash release with romantic drama Tum Bin 2. Both films being of different genres, Force 2 was expected to open at a decent start at the Box Office. Abhinay Deo directorial Force 2 is a story about ACP Yashvardhan (John) who teams up RAW Agent KK (Sonakshi) to bring down a mastermind terrorist Shiv. On the other hand, Tum Bin 2 is a romantic love story and music is the key element of the film. Anubhav Sinha directorial Tum Bin 2 apparently had a less hype than Force 2, but as the prequel was a hit, it was expected to draw the audience in the theaters. 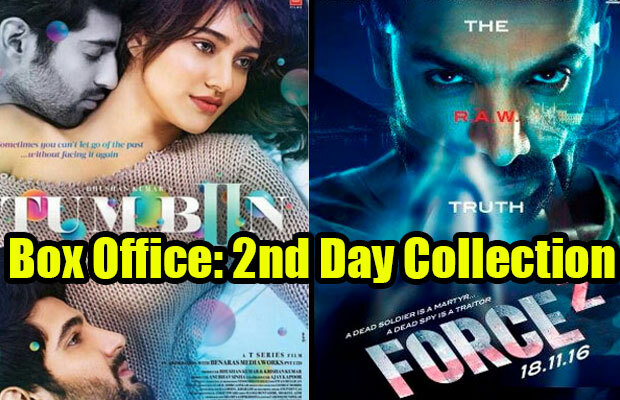 CLICK NEXT to know second day Box Office collection of Force 2 and Tum Bin 2. Last evening was the Coldplay concert, maybe that too affected the growth of the films. Previous articleWatch Coldplay Concert: Chris Martin Sings Vande Mataram And Channa Mereya, Fans Go Berserk! Next articleBigg Boss 10: Post Eviction, Karan Mehra Makes Some Revelations!